Thanks to digital photography, everyone has a camera in their pocket and pictures are now instantly accessible and shareable. The only drawback is the hassle of managing so many snaps and all the more apps and services that make it even more confusing. Here are the tools you need to know to bring order to your digital photography chaos. What it is: With each new version of iOS, Apple seems to change its mind about how it wants iCloud to handle photos. At the time of writing we have the new iCloud Photo Library (all your pictures) or the old Photo Stream (your most recent pictures). The new service gives you 5GB of storage space for free, and prices top out at $9.99 per month for 1TB of room. How it works: If all you ever use is Apple hardware, no problem, especially if you’re prepared to pay for extra storage. Otherwise, iCloud for Windows can help you get your pictures downloaded to Windows desktops and laptops — though it’s important to note this tool only supports the old Photo Stream (your most recent images) rather than iCloud Photo Library (all your images). The iCloud web portal also lets you view, download and upload pictures from computers that aren’t made by Apple. If you want pictures uploaded from an Android device to iCloud, then you’re going to have to use another of the services listed here and sync it with iCloud somehow. One way is putting your iCloud Photos folder inside Dropbox, for example, or you can use an IFTTT recipe to send pictures across directly. Manually copying photos from your device to the iCloud folder or using a utility to do it is another option. Should you choose to nest your iCloud photos folder inside Dropbox or Google Drive then that solves the problem of viewing pictures on your Android device as well. It’s not the most elegant solution, but it can be done if you’re determined to stick with Apple. However, as we’ve already mentioned, to get the full iCloud Photo Library experience you need to do this syncing on a Mac rather than a Windows machine because of the limitations of the Windows utility provided by Apple. 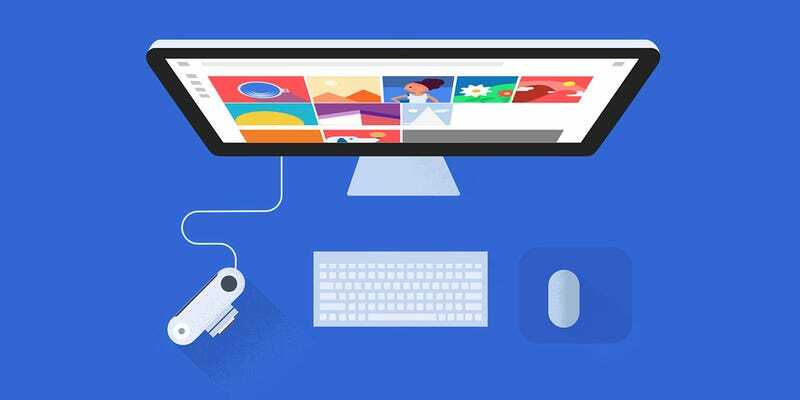 What it is: Google wants its Photos service to be the ultimate cross-platform solution, and compared with iCloud it’s refreshingly straightforward if you’re working with Windows, Mac, Android and iOS hardware (there are apps available for each). Google Photos will actually store all your images for free, if you’re prepared to put up with some resizing; otherwise, you get 15GB of room across all your Google services for no charge, with 1TB available for $9.99 a month and several other plans that go beyond that level. How it works: Pretty effortlessly, as you would expect from Google. If you take the completely free path then all your photos get reduced to a 16 megapixel resolution and all your videos go down to 1080p, but that’s still going to be enough for a lot of users. The web interface is competent enough, but desktop apps are available too if you want to upload pictures from a Windows or Mac machine (or a connected memory card). Getting local copies of your pictures on your desktop or laptop requires adding a Google Photos folder to Google Drive and then installing the Google Drive client too. Note: You have to make sure you’re not duplicating photos between the desktop utilities for Photos and Drive, but this is really the only confusing aspect of the Google Photos service. This being Google, the various apps are keen on automation too. Using the metadata stored with the pictures, they’re automatically grouped by location and time, and you can even search for specific objects, animals, or scenes. Some neat editing and album-making features are included along the way as well, and Google Photos is the service to beat right now with the only caveat being if you use nothing but Apple hardware and want to go native. What it is: Dropbox was making photo uploads and backups look easy a long time before Apple and Google, so it’s a shame that this excellent third-party app has since been overtaken. It still does a fine job of uploading pictures from any folder on any device, though you only get 2GB of free space in the cloud — upgrading to 1TB sets you back $9.99 a month. Carousel is a more photo-specific app from Dropbox (you get another 3GB of free space just for trying it), which does add some useful features, such as a timeline view. How it works: Dropbox is by no means a bad choice if you want to get all of your photos in the same place, particularly if you have $10 a month spare. Its polished mobile and desktop apps make syncing everything everywhere a breeze. If you’re working on devices running multiple OSes then Dropbox is still the best option on the market at the moment as far as pure syncing goes. If you opt to use Carousel, the app will even clear out old photos from your smartphone or tablet once they’re safely stored elsewhere. Dropbox has fallen slightly behind its rivals in terms of editing and photo management features, but it’s working hard to try and regain parity (and the Carousel web interface is a recent move in that direction). We shouldn’t forget about Dropbox’s slick sharing options, which are more intuitive than most — and setting up shared photo folders is straightforward, too. Get Dropbox installed on your computers and mobile devices and all of your pictures come together from everywhere as if by magic. It leaves the rest (editing, sorting, managing) up to you, which may put you off or be exactly what you’re looking for. It’s certainly robust and reliable, if a little lacking in the extra bells and whistles that the grandparents probably want. What it is: Flickr was once the go-to app for photo enthusiasts, and owner Yahoo has been busy trying to recapture some of that credibility. It remains one of the best online portals for showing off your pictures in public, and you can get apps for Android and iOS that send all your mobile photos to the cloud instantly. You also get a whopping 1TB of space free, no questions asked. A Pro membership option ($5.99/month) is available if you need more advanced stats on your photos and want to remove online ads. How it works: Flickr still offers the best set of management features in the browser, enabling you to split your pictures up into albums, groups, favorites and more besides. Thanks to the new beta Camera Roll feature, there’s also a ‘magic’ view tool that attempts to identify what’s in each of your photos and sort them accordingly (a little like Google Photos). There are some advanced sharing and tagging options to play around with. For example, if you’re a professional photographer wanting to show off your work, then Flickr is undoubtedly the best option in this list. Basic uploaders for Windows and Mac are also available to transfer your pictures from desktops, laptops and memory cards, but the emphasis is on keeping everything in the cloud rather than on your devices. If you need something that works anywhere, you’re not too concerned about having local copies of your pictures (though you should absolutely keep backups somewhere), and you want to take full control over how your photos are organized in the cloud, then Flickr is well worth a look. You don’t get any inline editing features, but you do get 1TB of space free of charge—no resizing necessary. What it is: Microsoft is still playing catch up with OneDrive and its photos component in particular. Thanks to a recent apps push, you can now sync your pictures to OneDrive from just about any device you can think of, but that’s about as far as the service goes for now. New users get 15GB of space for free and you can pay to extend that, all the way up to 1TB for $6.99 per month (which actually includes Office 365 as well). It’s a competent enough solution, most suited for users who spend a lot of time in Windows. How it works: Essentially, OneDrive does exactly what Dropbox does, except not quite as smoothly and with the same appealing minimalist style. If you want to get all your digital photos in the same place and accessible anywhere, then it will certainly do that. Because it’s built right into Windows 10, it works best with that operating system. It’s a little more clunky —though still perfectly usable—on all other platforms. You can organize pictures into albums and OneDrive also automatically applies tags to make images easier to find. These tags cover scenes, animals, photo types (sunset, portrait, etc. ), and more. There are no editing tools built into the online interface, but it’s easy enough to label and caption your pictures and share them with other people if you want. Like OneDrive as a whole, the photo storage and sharing tools cover all the basics without really standing out as a service you’d want to switch to. Windows 10 users who don’t need much from their photo storage service probably won’t see any reason to move away from OneDrive. For the rest of us, there are no truly compelling reasons to convert.